Windows Sidebar in Windows Vista may not load and start automatically when Windows Vista boots and starts. Windows Sidebar does not start automatically if user accidentally unselect the check box to instruct Windows Sidebar starts with Windows option when close and exit from Windows Sidebar. It’s also possible that somebody change the setting in Sidebar properties. Whatever the reason, if you want to enable and automatically run Windows Sidebar to start on Windows boots up, follow below steps. Click on Appearance an Personalization link. Click on Windows Sidebar Properties. 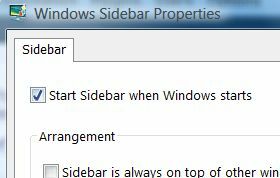 Tick the check box of Start Sidebar when Windows starts. Next time, Windows Sidebar will run automatically once you logged on to Windows Vista.